A little coterie of Brighton folks wandered up to the Self-hacking day in London, run by some of the Quantified Self crowd. I've not been to the monthly London meet-ups, but have been following this kind of thing for a few years now, on a no doubt hackneyed path that started with Nike+ and took in Mappiness, 23andme, and recently Runkeeper. Ian Clements told the by turns inspirational and horrifying story of his diagnosis with terminal cancer, when he was given a few weeks to live… 5 years ago. Ian's been gathering data on himself since 1974, and has a stronger imperative than many QS folk. I was horrified both at the attitude of medical professionals (who aren't interested in his data, or in one case will take it but on condition they don't reveal their findings to him), and that there's software out there he'd like to use for analysis of his multivariate logs, but just can't afford. Ken Snyder gave an overview of a few trends: convergence of the wellness, healthcare and social Internet industries; multi-sensor devices, medical devices become more consumer-oriented, rise of smartphones, and wearables; and consumer trends around simplicity, more mainstream use of QS (shifting the focus away from power users, where it is today), getting the isolation out of self empowerment, and data ownership. A fab day, overall. I've been to a couple of these events now, and every time they feel really exciting: QS feels like a movement that is just going mainstream. Kudos to Adriana and team for organising and running the day, and thanks to Hub Westminster for hosting. I'm camped out at OverTheAir putting the finishing touches to my hack and its presentation. This year I've done a solo effort: Facebook have been here (doing a couple of excellent talks, one about the Open Graph API and another about their internal processes), and I wanted to play with some of this. And I've been thinking about Bob Hoskins. More specifically, the "It's Good To Talk" adverts he starred in during the 1990s - back in the days when telecommunications companies ran adverts that said "go on, make a phone call" instead of trying to sell insubstantial and vaguely aspirational lifestyles. Bob's point was sound: there's more meaning to a telephone call than what's said, the act of calling is itself an expression of care. I'm pretty comfortable with digital communication, but I'm certain that if I emailed my mum a weekly update instead of calling her, we'd both feel something was missing. And look at Facebook, a history of my social contact: events I've been to, what I'm doing and with whom, things I like, where I've worked, groups I'm joining. Such an exhaustive social record, but with a phone-call shaped gap. So my hack was simple: I want to Facebook to record when I've made a phone call to a Facebook friend. I imagine seeing my sister "like" my contact with my niece and nephew; or seeing clustered outpourings of telephoned support when friends talk about strife they're going through. I chose to implement this as an Android app because Android gives me access to the calling information I need, and I'm currently using a Galaxy S2 myself. Finally, it creates a "call" action referencing this friend, which will appear in the Activity list of your timeline, and potentially elsewhere. At this point, the call can be referenced by other Facebook users: liked, commented upon, and so forth. Obviously this is going to make some people uncomfortable: who you call is private, right? But I can't help looking at how far we've come over the last 10 years in our journey towards sharing and away from privacy, and feeling that this is only a short step forward (or backward, depending on how you view Facebook, and social sharing in general). I'm going to run it for a while, see what happens, and see how it all feels. And if you'd like to have a play, you can find the source on github. There's one big improvement that's needed, and that's handling the case where you find more than one match on Facebook for a friend's name. A couple of weeks back I posted about how we might design for systems which we can't understand the inner workings of. I ended up chatting about this to a neighbour over fondue at LIFT last week, and in the course of this it occurred to me that this isn't just a design problem, it's also a societal one. The analogy I came up with (which my neighbour felt was a poor one, it has to be said) was the car: if you'd shown a car to someone in medieval times, they might have found the absence of a horse pulling it to be deeply disturbing. In much the same way, we expect to be able to understand what happens inside the software which we spend ever-larger chunks of our lives conversing with. So if we fear technologies we don't or can't understand, we need to find ways to move beyond this fear. If you're interested in this, Ben Bashford did a nice talk which is worth checking out. 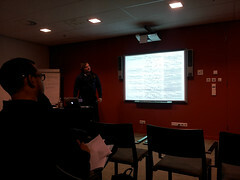 I've just had the pleasure of spending a weekend in Amsterdam listening to an interesting group of measurement-obsessed folks, at Quantified Self 2011. I was introduced to the QS movement a couple of months ago by a chance conversation with Colin Hayhurst, and it piqued my interest. As a former Nike+ user who'd seen the difference personal measurement made to my running habits (tripling the distance I regularly ran) and having participated in Mappiness for a year, I was looking forward to it - and wasn't disappointed. Steve Dean did several talks, all of them excellent. One was a history and demonstration of Asmthapolis, a project to track asthma attacks on an individual level by providing inhalers which automatically record their use, generating data which can be useful on an individual level (for combatting subjective views of one's own condition) and societally for mapping asthma attacks and using these maps to inform investigations - as happened in Barcelona in the 1990s, when the unloading of cargo shipments of soya beans were subsequently linked to asthma break-outs. 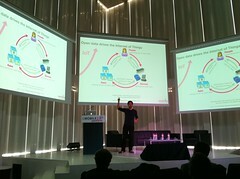 Some of the discussions in these sessions veered a little over my head (third order cybernetic feedback loops? emotional valence?) but Gary Wolf popped up to make a very interesting observation about the tension at the event between those demanding passive data collection (easy, transparent, all-seeing) and those for whom the act of actively recording was itself a source of joy. That was day one :) Day two followed day one, as it so often does. And finally, Laurie Frick ended the conference showing off her work, consisting mainly of handmade objects derived from self-tracking data - starting from the notion that visual patterns and the rhythms of the brain are somehow connected. A really interesting couple of days, that's triggered a few ideas I want to follow up and given me a great deal to mull on. The audience was enthusiastic and unashamedly geeky - it all definitely felt excitingly early-stage, though whether in a post-Nike+ world that's accurate is another matter. Updated: Ian Li has mailed me with links to his design considerations presentation and one he gave on integrating visualisations with Innertube.me. To London, and a lecture at the LSE by Katalin Farkas on Extended Selves. Katalin is a philosophy professor, and presented an interesting theory: the mind is composed of two sets of features, the stream of consciousness (everyday meanderings that bubble up and away) and what she calls "standing features": the long-held beliefs, desires, etc., which define us. When we're asleep, the former shuts off, the latter persists: we are still ourselves when unconscious. So her thesis (the Extended Mind, or EM thesis) is that we are a set of beliefs or dispositions, and where these dispositions are stored makes no difference to whether they are beliefs: a man with poor memory who documents his beliefs in a notebook and retrieves them from there. This is controversial because the notebook is outside his brain ("spacial extension", as Katalin referred to it), but we accept prosthetic limbs, so this shouldn't be a problem. And what if the notebook were inside the cranium, would that make a difference? How far can this go? Consider a student who passes her exams with the aid of a 24/7 consultant: she understands what she's writing but didn't originate it. The consultant is effectively an external prop. This might be morally problematic today, but many of us outsource some of our beliefs in specialist areas to specialists: you could consider accountants to be a repository of outsourced beliefs. If the EM thesis is correct, the value of certain types of expertise may change over time. We see this happen today - like it or not! - with spelling, or driving directions. What it takes to be an expert changes, with the addition of expert devices. Katalin spoke about "diminished selves", which troubled me slightly: I couldn't help wondering if she would have considered our species to have diminished when we invented language, or the written word, and could start transmitting, storing and outsourcing our knowledge. And I also observed that the problem many people have with digital prostheses might relate to lack of control over them: they require electricity or connectivity to function; they don't self-maintain as the human body heals, and the data flowing through them might be subject to interception or copying. Cunningly scheduled the two days before Sonar, Mobile 2.0 has snuck into my calendar for the last few years; and with Rudy knowing everyone in Europe, it's a good opportunity to meet a set of people I don't bump into around London (LIFT is similar, but perhaps more biased towards academia and away from the Mediterranean). A combination of a late arrival in Spain the night before, an hour or so preparing slides for my talk tomorrow, complicated travel arrangements and pure laziness meant that I missed the very first session. 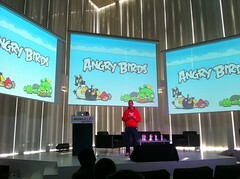 I arrived at the impressive venue (Telefonica R&D HQ, I'm told) to find Peter Vesterbacka of Rovio, proudly displaying a bright plumage of Angry Birds merchandise and talking about their meteoric rise to fame. Peter's an old face on the European mobile scene and there's a sense that - much as with Russell Buckley - he's someone who's put the time in and is now reaping his just rewards. He's quite disarming, pointing to the 51 games they released before Angry Birds (which now coasts at 1m downloads a day), and presents Roxio as not a unique success, but rather part of a broader trend: mobile is a good place to build entertainment brands thanks to its wide reach and ability to engage daily. Compare production costs for mobile games with anything that might be produced in Hollywood; look at how Roxio roll out seasonal variants and regular game updates. "We're not a mobile games company, we're a next generation entertainment franchise", he squawks. Rovio were a service business of 12 people (a similar size to FP), who successfully made the move into products. My feathers ruffled by jealousy, I nonetheless enjoyed hearing Peter talk so disarmingly about his business. A panel discussion followed. Much of it covered well-trod ground (gamification, augmented reality and the importance of context) but the panel covered it well. They were united on the importance of context awareness, Which seems to me to be somewhat similar to targeting of advertising: mining a large amount of raw data, mining it and drawing conclusions from it. Given the internet and mobile advertising industry's failure to deliver on the promise of well targeted advertising over the last 15 years despite the vast amount of data ISPs and operators own concerning their customers, I found it hard to share their optimism about our ability to reliably derive context from sensor data? What will happen here that hasn't happened with advertising? 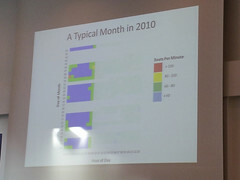 I suspect that deriving anything reliably useful about context from a mass of sensor data is a Really Hard Problem... Though thinking back to Ted Morgan talking about work Skyhook had done in this area in a talk here 2 years ago, there seem to be some opportunities lurking in the short term. Usman Haque was up next to talk about Pachube, an amazing service I keep hearing about, getting enthused for, and failing to do anything with. They're am aggregator of sensor data, and Usman presented a stirring and deliberately contradictory Bill Of Rights for the Internet of Things. Definitely worth more attention. Di-Ann Eisnor of Waze followed up with a talk about the participatory city - essentially some use cases for the kind of data that Pachube is gathering, focused around some nice demos of her product. Waze looks to be a journey optimiser, using realtime traffic data to better inform drivers of routes to take. Another panel: the panelists dwelt a little too long on the role of government in regulating or otherwise facilitating open data for my liking. Not that it isn't an important topic, but I'm more of a nuts and bolts kinda guy. Having spent a few evenings recently watching Adam Curtis' documentaries, I was driven to wonder how helpful it is to employ the metaphor of city as computer. What do we run the risk of losing by viewing our social structures - which aren't digital - through this lens, and how can we avoid losing it? It feels to me that nowadays if we measure something (school grades, say, or NHS waiting times) we are driven to optimise for the thing being measured, at the expense of that which can't be measured (a well-rounded education, say). I wonder if this is a valid concern, or just the first signs of my turning into an old man bemoaning contemporary society? Coffee, and I'll confess I didn't follow the next couple of talks too closely. Andy Goodman of Fjord Madrid gave a thousand-foot-view of the Fjord view of the world; WorldReader seemed a worthy effort to put e-reading kit into the hands of pupils in the developing world. AppCircus closed the day, and once again I was struck by how many really nice-looking apps (such as Nomad Analytics, who did a good presentation of what looks like an excellent Blackberry front-end onto Google Analytics) didn't have much of a solid business behind them. Sign of an app bubble, a congenital weakness in European startups, or me missing the point of what AppCircus is? I'm not sure. For me, iscandit stood out as a business with IP, a good-looking product, and some thought as to revenue and likely partnerships. "Even though we had some initial teething issues, the research from the audience and on site analytics showed that the audience really liked sharing their unique experience with (or bragging to) their friends. We had large interaction spike from the news story posts from seeing a high number of 'likes' and 'comments' on each of the check ins. This interaction was exactly what we were trying to achieve and it really worked. Interestingly, the stats also showed that more women engaged with the product rather than men - something that needs to be investigated further - does social syndication in this way appeal more to women than men?" I wandered up to London last night with Ellen to see War Horse, a rather interesting show based on a World War 1 story, using a variety of life-size puppets. Puppets are Ellen's thing at the moment (she did a couple of shows during Brighton Festival), and I rather enjoyed Flogging a Dead Horse when we caught it last year. I found the script of War Horse slightly on the mawkish side, and long after having shared a house with an academic who specialised in the subject, I still find World War 1 material challenging in general. But that didn't matter one jot - I was absolutely blown away by the technical mastery of the puppets, the unnervingly lifelike movement ascribed to them, and the playfulness with which they were employed. You haven't lived until you've seen a wheeled mechanical duck get pushed around the stage in a waddling motion, it's eerily articulated neck pecking at the floor. Over and above the relentless detail of the animal movements, a few moments really hit home: watching a trio of puppeteers slowly withdraw from the corpse of a fallen horse, driving home the finality of its death; one of the cast casually slapping one of the "horses" on the rump during the final applause, to persuade the artificial beast to leave the stage; and the insistent pestering of a young French girl for chocolate. By the end, the animals may as well have been real; their suffering certainly was. And yet they're strange things constructed from wood, wire and leather - not by any means real, they ought to sit snugly in the uncanny valley. I couldn't help but relate my own empathy with War Horse to some of what I saw Sherry Turkle talk about last week: I *must* hurry up and read the first half of Alone Together, which deals with social robotics. 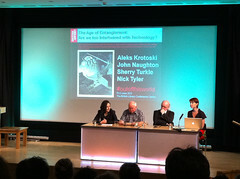 I had the good fortune to imbibe a double-dose of Sherry Turkle this week; Kate and I saw her present at the LSE on Thursday evening, then crept to the British Library on Friday to see her in a panel discussion with John Naughton, Aleks Krotoski and Nick Tyler. As usual, I was late to the party - never having heard of Sherry until Roman Verostko quoted her in a chat about algorithmic art earlier this year: "We think with the objects we love; we love the objects we think with". That quote led me, via a few other conversations, to the copy of Evocative Objects which sits, sadly unread, on my bedside table; and to her recent book Alone Together - which she billed on Friday as a Bowling Alone for digital natives. Back at MIT, Sherry and many others went on a 3 day retreat to consider what home computers would mean. Aside from the gaming possibilities (which everyone agreed were clear), few applications were proposed. Calendaring and address books were brought up and rejected as stupid; no-one thought that anyone other than academics would use them for writing; tax preparation was floated as another possible application: "People stayed for 2 days and 5 meals, but there weren't many ideas". One refrain from Sherry which I had trouble finding evidence for was the notion that solitude is, in and of itself, energising and nourishing. It seemed to be a belief she held strongly, but unlike much of her other (plainly well-researched) material she didn't provide much backing for this point. Whilst instinctively I'm inclined to agree with her, I'd like to see some evidence for the psychological value of solitude; or is it just something which a generation pre-Internet naturally acclimatised to, that digital natives have never needed? During the panel discussion, I think it was Sherry who brought up the example of people texting one another at funerals (as a demonstration of the sinister reach of technology into inappropriate places). An interesting little back-chat on Twitter kicked off, with one poster pointing out that 30 years ago the idea of playing pop music at funerals would have been anathema, where now it's reasonable (to some, at least). "Is this not standard generational moral panic? ", someone in the audience asked... and whilst I'd left the talk on Thursday generally agreeing with Sherry, I left Friday less sure. How can we possibly be objective about technology, or is it not, as someone else in the audience pointed out, "a failure of perspective to consider humans and technology as separate"? Like stamps for the real world. If they release "sticks to poke people with" I will very likely buy one. The Natural Language Toolkit: "Open source Python modules, linguistic data and documentation for research and development in natural language processing and text analytics"
Managing Your Own Psychology: "Ideally, the CEO will be urgent yet not insane"
Fast Path to a Great UX - Increased Exposure Hours: "Exposure hours. The number of hours each team member is exposed directly to real users interacting with the team's designs or the team's competitor's designs. There is a direct correlation between this exposure and the improvements we see in the designs that team produces." Patterns in Functional Programming, a blog/book-in-progress about functional concepts. On the tech side of things, this is interesting me at the moment... or more accurately, a few developments internally at FP and the launch of Functional Brighton might kick me into learning Clojure, something I've meant to do for a couple of years now. The cost of being first, another excellent post from The Ad Contrarian (one of my favourite blogs, a beautiful little diamond): "While everyone wants to say they are at the “leading edge” of digital media technology, it seems to me that there is little or no advantage to it. In fact, with so many new advertising and marketing technologies evolving, there may be a greater potential risk than reward in being at the leading edge." Working with the Chaos Monkey, a tale of systems components deliberately set up to fail in order to test overall system resilience. Stewart Lee on content: "A few years ago, I received an unsolicited e-mail asking me if I was interested in “submitting content”. I was confused. The sender explained that I was a “content provider”. Did I want to provide content?". Also "I am a curator. What a dead word. It sounds like someone stirring turds in a toilet bowl with a stick". Pepsi Introduces "Social" Vending Machines: "I had never thought of a vending machine as anything other than a pay-refrigerator. Apparently to these people it is some form of mystical deity"